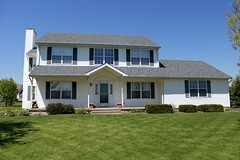 Homeowners never look forward to hiring a Toms River roofing company to repair or replace their roof. If you suddenly realize you have a leaky roof, the best thing to do is to take the steps necessary in order to fix the problem. To do this, it’s best to understand your options based on the situation. These tips should help you in deciding when it’s time to call a professional Toms River roofing company. Sagging: If you roof is sagging in specific areas of your house, this can mean a few things. The original material could have weakened over time due to water damage and deterioration. This can cause water to gather in specific areas of the roof, and can be visibly noticeable from even the interiors of your house. The material could have been faulty, so in all circumstances it is always best to consult a professional Toms River roofing company. 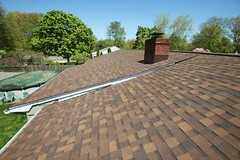 Damaged shingles: Your roof may be damaged as a result of lower quality shingles and weather damage. Whatever the cause, remember that they are not indestructible. Sometimes they can crack, tear, or in some instances break off entirely. Although shingles can be made of wood, slate, flagstone, fiber cement, metal, and even plastic, the most common type are asphalt shingles with a fiberglass base. If it is the case that you need to replace these, don’t panic. If installed correctly, asphalt shingles are affordable and can last up to fifty years. Fallen debris: If your roof is beginning to weaken or deteriorate, a common sign you may notice is that the material seems to easily fall or leave debris after harder weather conditions, or even just a strong wind. If this is the case, you’ve caught something early on and can identify that there may be some structural or water damage to have taken care of. Mold or mildew: Sometimes the case is that the draining is not up to par and rainwater resides, allowing for mold and mildew to accrue and weaken the structure. Mold and mildew can be damaging to any aspect of a house, and it is best to take care of this problem right away if possible to avoid further damage due to growth. 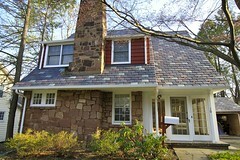 A leaking roof: This is an obvious sign the it’s time to call a Toms River roofing company. If your roof is leaking, there is no question that you need to have it repaired or replaced. A leaking roof is not only a health issue for yourself and your family, but a hole that is leaking rainwater is to just become larger. It is also an easy trip to hidden molds and mildews building going up, so try to act on this fast. 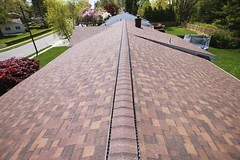 Looking for the Best Toms River Roofing Company?